With more activities, daylight, outdoor parties and vacations, summer is a precious time of year. Do you have amenities at home that make the most of the season? According to new realtor.com® research, features that scream “summer” can earn homeowners more profit. An outdoor shower, for example, is at a 97 percent price-per-square foot (PPSF) premium—exceedingly high, because most are on properties on the water—while a barbecue grill, associated with summertime, is at 26 percent, and a pool and/or spa is at 25 percent. 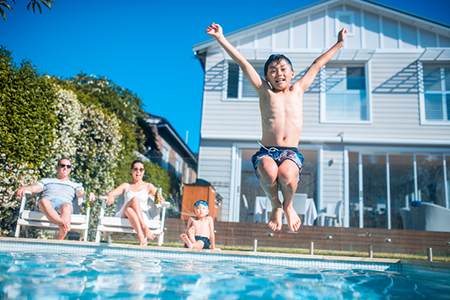 “Buyers love special features that enable them to get the most out of the summer months, and are willing to pay more for a home that has them, according to our analysis,” says Javier Vivas, director of Economic Research at realtor.com. However, location matters. According to the analysis, Massachusetts, Hawaii and New Jersey contain the most listings with outdoor showers, but New York, New Jersey and South Carolina have the highest premiums for them, at 256 percent, 164 percent and 140 percent, respectively. When it comes to BBQs, Arizona, California and Utah have the most listings with them, but only Arizona and California have the highest premiums (33 percent and 23 percent, respectively). Arizona and California are also contenders for the most listings with pools, but New York has the highest premium for one, at 224 percent. When marketing a property primed for summer, the description is key, the research shows. In Michigan—where bitter winters and lake life meet—descriptions on listings mentioning “summer days” or “summer fun” command a 36 percent premium.